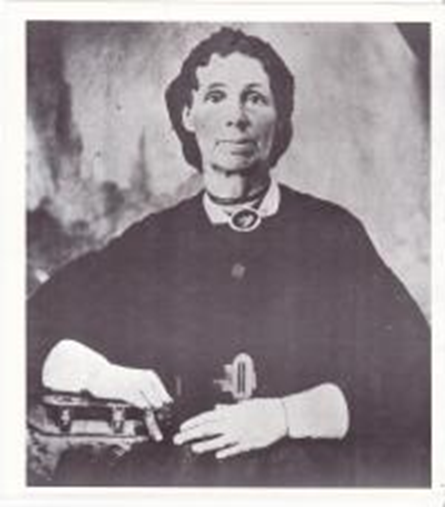 Tamma Durfee was the daughter of Edmund Durfee, a member of the Church of Jesus Christ of Latter-day Saints who was murdered by a mob near Nauvoo in November 1845. Edmund Durfee has always been someone I have been interested in, and I found that through this short 6 page autobiography of his daughter I have come to know and appreciate not only Edmund, but his daughter and the family that he raised. This family is an example to me of great faith in Jesus Christ, toughness, and the overall awesomeness of the pioneer spirit which in many ways has been lost to us in this modern era. How many of us have this kind of tenacity, this faith? Tamma Durfee is a wonder to me, a woman of great strength, love, and determination. I hope to one day meet her! Written by Tamma Durfee Miner for the Relief Society Jubilee Box of the Utah Stake Relief Society. Opened in May 1930 and given to Frances Carter (Clark) Knight. My father’s name was Edmund Durfee, he was born in Rhode Island on the 3rd October 1788 of Dutch decent. My mother’s name was Magdalena “Lana” Pickle and she was born 6 June 1788. Her father and mother were from Holland. I was born 6 March 1813 in Lennox, Madison County, New York and lived there until I was about nine years old when we moved to Amboy, Oswego County. Father bought some land, built him a house, made a small farm, and worked at his trade that was mostly carpenter and millwright. We lived there until the first of June 1830, father bought more land. There were lots of maple trees. Then father wanted to go West so he sold his sugar bush and farm and everything started for the south of Ohio. We went through Camden Village to the canal, went on the canal to Buffalo, we went to Briggles (Ruggles)in Huron County. Father bought land and went to work to make a home, and the next winter in 1831 we heard about the Mormons and the “Gold Bible.” The next spring Solomon Hancock came preaching about Joseph Smith and said that the Lord and the Angel Moroni had revealed them to Joseph Smith. Solomon Hancock joined in with us the Methodists and Campbellites, and he would preach in our meetinghouse. We would go to hear him and many were astonished at his message for it was so much different from what it had been reported. This was sometime in April 1831, and my father Edmond Durfee was baptized about the middle of May and my mother and sister, Martha and brother, Edmund were baptized about the first of June by Solomon Hancock. I believed it the first time I heard him preach, that the Book of Mormon was true. I was a Mormon in belief but was not baptized until December 1831 and will tell you the reason why I was not baptized. I was keeping company with a good young man, as I thought, and I was told that he had said that he would not have a Mormon for a wife. So I waited until after I was married. I went to the Mormon meetings and sometimes to the Methodists until 9 August 1831 when I was married to Albert Miner. He was born in Jefferson County, New York on 31 March 1809 and was the son of Azel Miner and Sylvia Monson. We got along first rate and we went to meetings sometimes to one place and sometimes to the Mormons until December 1831, when my father was going on a mission to the State of New York and he baptized me before going on his mission. Albert Miner`s mother, brothers and sisters had a great deal to say about the Mormons as they did not believe in the Book of Mormon. But he told them, “the more they had to say, the sooner he would be baptized”. He waited until the first of February 1832 when they cut a hole in the ice and baptized him. My oldest daughter Polly was born 1 May 1832. My father gathered some of his carpenter tools, seed grain, farming tools and in a company with others, he started for Jackson County, Missouri, on the first of February 1832. To build a place for all his family to go. He came home in the fall of 1832, sold his farm and all his possessions and we started for Kirtland, Ohio on the first of May 1833. The Lord had said “He would keep a strong hold” for five years in Kirtland. We bought us a farm, built us some houses and prepared to live. I was here on the fourth of July when they wanted 24 Elders to lay the corner stones to the Temple in Kirtland, and they ordained George A. Smith and Don Smith to make the number twenty-four, six at each corner. Albert Miner, my husband, helped to haul stone every Saturday for a long time to build the Temple. My oldest boy was born 22 October 1833 we called him Orson. The next spring most of the Elders were called to volunteer to go and redeem Jackson County. Albert Miner told Mr. Dennis Lake he would draw cuts, to see who would go and who would stay and take care of both families. It fell on Albert Miner to stay and take care of the families. Dennis Lake went with the company to redeem Jackson County and when he got back he apostatized and sued Joseph Smith for three months work, $60.00. On the 4th of July 1835, I had a son born. Called his name Moroni and Joseph Smith blessed him and said: “He should be as great as Moroni of old, and the people would flee unto him and call him blessed”. They were still building the Temple. Some of the brethren came from a distance and stayed with us until the next spring. They received their endowments and were there to the dedication of the Temple in March 1836. After that a good many began to apostatize and broke up the Kirtland Bank. I had girl born on 18 June 1836. We called her name Silva. A great many things transpired about this time that I haven’t time to write and some that I can’t place them. Land came up and sold for a large sum of money and they had a great land speculation, and many left the Church of the Latter-day Saints. I had a boy born 26 September 1837 and called his name Mormon. In the Spring of 1837, my father sold his farm and all his possessions and started for Caldwell County, Missouri, where we stayed that summer and fall. Those that left the Mormons grew worse until Joseph and Sidney Rigdon and Father Smith had to leave in January in the middle of winter. That fall Albert had a very sick spell. The last of January he got some better so he could ride in a sleigh on a bed while I held an umbrella over him. With two little children on my lap we went 80 miles, from Kirtland, Ohio to Huron County, New London, Connecticut, where Albert’s folks lived. Four days on the road were pleasant and warm but it turned fearful cold winter weather. Albert got better and we stayed until May. We went back to Kirtland and sold the farm, put some of his means in to the Kirtland camp and took the balance, Albert Miner, wife, and children started for Far West, Missouri. About the middle of June 1838, bidding Albert’s mother, sisters, and brothers, all farewell for the Gospel’s sake. His father had died in 1829. We traveled until we ran short of means, and then we stopped and worked until we got enough to go ahead. We visited the Kirtland camp and then went on to Missouri and got to Dewitt the last of August. The children were all sick, and I had been so sick that I could not walk, and Albert was so sick he could not harness and take care of the team. We soon got better, we stayed one week at DeWitt and then started for Far West all alone, we got to fathers about the 1st of September. The children were all sick, but father said we would all get better which they did in a few days, all except Silva who did not recover and died about the first of October 1838. The mob gathered and killed many and drove all the Mormons from Adam Diamon to Far West. Not being satisfied, the whole state with the Governor at their head gathered by the thousands to drive them from Far West. They wanted Joseph Smith & Sidney Rigdon, our leaders and the Twelve, and all they could get and put them in prison and they got mad. Some were bailed out and others had to stay and take up with such a fare as they could get and be fed on human flesh, but Joseph told them “not to eat it,” for the spirit of the Lord told him that it was human. Thus we were plundered, smitten and driven from out homes, our lives were threatened and we were ill-treated on every side by our enemies. Enemies to the truths of heaven came along, one to five hundred right to our houses and nobody around but women and little children, take our men prisoners without any cause, only because they were Mormons and believed in the truths of the Gospel. They wanted to know if we had any guns, pistols or ammunition or butcher knives and such things. No one can tell, only those that passed through it and was an eye witness to it can describe the feeling of the Saints and what they passed through. Those men that were at liberty and had teams helped others to the Mississippi River, then went back after their own families. Father’s folks had lived there one year. His name was Edmond Durfee. He left in 1837, Albert and Tamma Miner with five children got to the Missouri the first of September 1838 and lived on what they called “Log Creek” six miles from Far West. I was there when they killed David Patten when they took a lot of prisoners and the Saints had to lay down their lives to their enemies. Albert Miner was one that had to take a load to the Mississippi River so we did not get away until the first of April 1839. We had witnessed a good leaving in the cold and dreary winter. We crossed over to Quincy, went up the river to place called Lima, Hancock county, Illinois. There we built us a house and bought a small place and fixed to live here a short time. But the devil wasn’t dead yet. In a short time there was some that would go to Lima and get drunk and come back swearing and tearing enough to frighten men, let alone women and children. I told Albert that I didn’t like to live there and hear them swear. While at Lima I had a girl born 13 January 1840 and we called her Matilda. We stayed there till the year from the next September. Got along the best we could. Every fall and spring we went 30 miles to Conference and join the fourth of July to training. I had a boy born 7 September 1841 called his name Alma L. In the spring my husband bought a place four miles east of the Temple in Nauvoo and lived there where we could get to meeting and get back home by night. I had a boy born 12 June 1843 and we called him Don Carlos Smith. Was there in 1844 when Joseph and Hyrum were martyred. I went in and saw them after they were taken to their homes. I had been acquainted with them for 12 years. In May I heard them both preach and talk to the Saints a good many times. I heard Joseph once talk and preach for five hours to a congregation, and no one was tired. (This was in Kirtland before they built the first Temple.) A great many incidents I have passed through but have not time to name them. We still lived in Nauvoo. After they got the Nauvoo Temple done, they did temple work in January, February and March. The gentiles and the mobocrats threatened us and told around how they would kill and drive them (the Mormons). They did kill and drive them from Lima, and shot my father Edmund Durfee and killed him instantly on 19 November 1845. He who had never done them any harm in his life, but on the contrary, had always taught them good principles of truth and uprightness and greatness and morality and industries all the days of his life. But before this, they drove them all out of Father Morley’s Settlement, turned there sick ones out. Drove them all out to live or die. Rolled my brother, Nephi up in a bed and threw it outdoors, when he was sick. Went to the oat stack and got two bundles of oats and put a brand of fire in them and threw them on top of the house and said they would be back next morning. Father was trying to move someplace and they came back and shot all their guns and ran them all off, and plundered and made a fire, burned houses, furniture, clothing, yarn looms, cloth, carpenter tools. The iron from the tools they picked and filled a barrel. Everything all around burned to ashes, and the mob went from house to house driving them out, sick or well, it made no difference, till they burned every house in the town that was Mormons. The men from Nauvoo got their teams and started for Lima and traveled all night and day to get the families that had been burned out doors. My husband was one that traveled all night and got cold, took a chill and was ill for a long time. The mob said that they could come back and gather their crops, They were nearly done, so decided to stay over Sunday. When it got dark the mob came back and built a fire close by the barns. The Mormons thought they meant to burn their houses and rushed out. The mob stood back in the timber and as the men got between them, they shot off about a dozen guns, my father was the only one killed. They built a fire in different places, one in the corn crib and the shucks was on and dry rail and dry shucks and it burned a little and went out, so you see, they couldn’t go any further than the Lord let them. This was the fall of 1845. They still kept gathering all the fall and winter. The saints worked hard all winter doing temple work. They worked at repairing and building wagons getting ready to leave. Some of them before the ice broke up in the river and the rest soon after. Little over one year before my husband had his farm bought from under him by a man by the name of Ephriam S. Green, with all he had worked and done and paid on it. We were turned out doors with a family of little children. So he rented one year and turned out one span of horses and bought a piece of land in order to make another home. On 5 March 1846 I had a girl born, called her name Melissa. We remained there for a time. The mob gathering every little shile and threatening all the time, how they would drive the Mormons. At last a great many left, not knowing where they were going, to hunt for a place in the wilderness among the savages and wild beasts over the desert beyond the Rocky Mountains where white men had never lived. In the spring the mob began to gather once a week and threaten to drive out what was left. The first of May we moved town, sold our place for a yoke of oxen and wagon thinking to start on in two or three weeks, but the mob gathered every week right on the public square close by the house. The mormons told them we would go as fast as they could get ready and teams to go with. Mostly women and children were left and they didn’t want anymore of the men to leave for fear of what might happen. So we stayed and my oldest brother and his family were with us. Mr Albert Miner was born in the state in New York, county of Jefferson, March 31, 1809. His father’s name was Azel Miner, his mother was Sylvia Monson. Till as last new citizens and apostates to carry the day they used to carry the letters in their boots and get all the news. Till at last they said there were about 2,000 of them (the mob) camped outside of town In the afternoon here they came into across the lots to get in town. There were only fifty (mormon) men to go out to meet them. They drove them back that night. In the morning, at 2 (am) it was moonlight, the Mormons went and fired right into the camp and they fired guns and cannons on both sides tlil 2:00 that afternoon. They killed three Mormon men, one man was named Anderson and his son, both killed by one cannon ball (they said they did not follow counsel). One man was killed by a cannon ball in a blacksmith shop, three men were slightly wounded. My brother was wounded by a gun between the cords of his heel. There were only about 50 of the Mormon men against 2,000 of the mob, ten of them had to be on guard, two on top of the Temple with spy glasses. They went into Law’s cornfield and there they had their battle, they were seen to fill two wagons with the wounded and killed. The next morning a woman stood in the second story house and saw the mob put 76 bodies in Calico slips with a draw string around the top before they left home. The Mormon women rolled the cannon balls up in their aprons, took them to our boys and they put them in the cannon and shoot them back again when they were hot. But there were a great many more missing, it was a fearful time. I could have crossed the river but I would not leave my husband. In about two days we had to surrender, lay down their arms. I saw the mob all dressed in black ride two by two on horseback. It looked frightful, they said there were 2,000 of them rode around the Temple in Nauvoo. The men had to ferry the boat over five times for each family. My husband had to ferry it over five times for my brother that got wounded and five times for us. We got over, stayed there two weeks, we slept on the ground waiting for help, there were fourteen of us to one wagon. My baby got sick, but we stayed anyway and in three days my baby was died on the first of October 1846. We traveled on one day and the next morning we buried her, she was seven months old, her name was Melissa Miner. We went one day where we were acquainted went on three days and came to Iowaville. We stayed there through the winter while my husband worked at hauling and running a ferry boat. When my baby died I took sick and never sit up only to have my bed made for nine months. My husband thought of moving to the Bluffs but a good many came back to get work so he cut and put up hay for his stock and then said he would go back to Ohio to see all of his folks. He started afoot to the Mississippi River all alone. Short of means, he went two of three miles and right before him was $5 in silver on the ground. He went on and found his folks all well, but no one believed in the Gospel. All opposed him. He was gone ten weeks, came home very unwell and being gone so long, he was homesick and tired and had walked in the rain all day. Polly my oldest daughter who was fourteen years old, took care of the family of nine and waited on me while I was sick and while her father was gone. Not feeling very well when he came, he thought he would feel better after he rested, but he grew worse. He tried to work for half a day and go to bed the other half. He came home about May 17, 1847. He kept that was, first better then worse till at last he dropped off very sudden. What a hard blow, as we thought he was getting better. I and the children thought a better man never lived; A kind, good natured disposition, industrious. He was a genius, could do anything he saw someone else do. Alma and the little boys said; “Which way shall we go? We will not know the way”. They thought their father was so perfect that he could do nothing wrong and that he knew everything. Polly and Orson were the oldest, they had to take the lead and go ahead and plan. Albert’s folks had offered him everything if he would stay with them and not go with the Mormons, but the Gospel, the truths of the Book of Mormon and the Holy Priesthood were all that he wanted. Polly was a true and faithful daughter to her mother and Orson was a true and faithful son. Albert Miner died January 3, 1848. He was so very anxious to go to Council Bluffs and keep up with the Church so the children and I went to work and got things together and the next July 1848 we came to Council Bluffs Iowa. We stayed there about two years. We worked and got things ready to come to the valley. I and my five boys and two girls, started with a company of one hundred wagons June 10, 1850. We traveled across the plains with the ox teams. Had many a struggle. Although we got along much better than we anticipated. The first of September we landed in Salt Lake without any home or anyone to hunt one for us. We were very lonesome indeed. We stayed with father and mother Wilcox for 2 weeks, when Enos Curtis came along and said he would furnish me and the children with a home. Thats what we need most as winter was coming on. We were married 18 October 1850. Lived on the Jordan the first winter and I and my children all had irriciplis in the throat. My oldest son died with it on 5 March 1851. He drove the ox team across the plains for me and a kind good natured boy as ever lived. The next April we moved to Springville, Utah. Got a farm and a place to build up the kingdom. On 18 October 1851 I had a girl called Clarissa Curtis. We lived there and the boys grew up and Enos Curtis and his boys and mine all worked together. Raised their grain and stock and paid their tithing. I had a girl born 23 February 1853. Called her name Belinda. We still lived there in Springville. The next spring Enos went to Iron County with Brigham Young and Company. When they got back they made a party for the company on 12 June 1854. One year from that day I had a pair of twin girls named Adelia and Amelia. The next spring Enos began complaining of not feeing well but he kept on to work for a while till at last he gave up. After a while he began to take something and thought he was better, but he finally got worse. Lived till the first of June 1856 when he passed off just like going to sleep without a struggle or a groan. His children were all with him but two. One boy was on a Mission to England. Myself and boys and three little girls were left alone again. One boy was 20 years old. One 17, one 14 and the other 12. We still lived in Springville. Farmed and raised our wheat and stock, paid our tithing and raised the little girls, all but one. She took sick and died before her father. One of the twins named Adelia. In 1857, I was sealed to John White Curtis at April Conference and I had a girl born 16 Jan. 1858 called her name Mariette Curtis. I had five boys and four girls by Albert Miner, four girls by Enos Curtis and one girl by John White Curtis. Belinda Curtis took sick and died 17 November 1873. I had 58 grandchildren and 11 great grandchildren. The children that lived all grew up to be men and women. All married and left home. All in the Church and pay their tithing and live their religion as best they can as far as I know. I had 14 children in all and they were all very good to me. Albert Miner was Joseph Smith’s life guard in Kirtland, Ohio. Also my brother, but he left the church. In those days there was but a handful of saints in comparison to what there is now. I have passed through all the hardships and drivings and burnings and mobbings and threatenings and have been with the Saints in all their persecutions from Huron County to Kirtland Ohio and from Kirtland to Missouri and then back to Illinois, and then across the desert. I write this that my children may have a little idea of what their parents passed through. For want of time I have passed over some of the important things. I hope my children will appreciate these few lines for I do feel highly honored to be numbered with the Latter-Day Saints and I pray that our children will all prove faithful that they may receive a great reward. This entry was posted in Inspiration, Kindness, Leadership, Love, obedience, Pioneer stories, Suffering, War, Women of Faith, Zion and tagged Battle of Nauvoo, Determination, Edmund Durfee, Faith, Pioneer stories, Strength, Tamma Durfee. Bookmark the permalink.